US, 1986, 80 minutes, Colour. Voices: Catherine Blore, Christopher Plummer, Dom Deluise, Madeline Kahn. 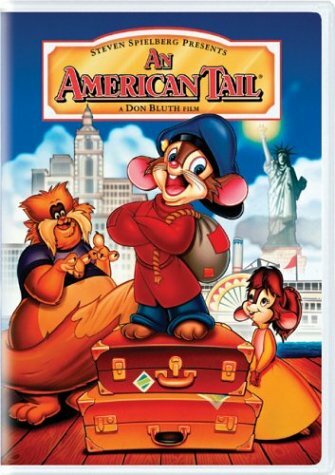 An American Tail is a most entertaining animated feature. It was directed by Don Bluth, who had previously worked with the Disney Studios. It was produced by Steven Spielberg's Amblin Entertainment. The film parallels those stories of migrants at the end of the 19th century, victims of Cossack raids in Europe, migrants on ships in storms over the Atlantic, landing at Ellis Island and having their names changed, full of hope for the wonderful dream of America (where there are no cats and the streets are paved with cheese!). The film shows also life in New York, Hester Street and the sweatshops, the gangs in the streets, the corrupt politicians (also cats). The film also shows the mice taking stances against the oppression of the cats. There are some entertaining side characters as well, especially Christopher Plummer's Henri, involved with the building of the Statue of Liberty, and Dom Deluise's Tiger. Madeleine Kahn is Gussy and Nehemiah Persoff is Papa. The film is well-drawn, full of entertaining detail. The musical score by James Horner is quite striking, as are songs including the Oscar-nominated `Somewhere Out There' and enjoyable `Never Say Never' sung by Christopher Plummer. A sequel was made in 1991, Feivel Goes West. 1. Entertaining animated feature? For children's audiences, families? 2. The quality of the drawing: the settings, Europe and New York, the sea? The characters? The background detail? The colour photography? The musical score, the insertion of the songs, the personalities singing them, accents and humour? 3. The title and its being part of the American Dream - the play on the word `tail'? The animals mirroring the humans? 4. Russia in 1885, the Moskowitz family, the Cossacks and their attacks? The Cossack cats? The destruction, Papa, Mama and the children? Their deciding to migrate? Travelling to Hamburg? Boarding the ship for New York - paralleled to the humans? 5. The voyage, the mice below decks? Life on the ship, the family together? Feivel and his sister, the baby? The bonds with the family? Playing with the other mice? The storm, the violence, Feivel and his chasing his cap, his being washed overboard? The family and their grief? Feivel presumed dead? 6. The arrival in New York, Ellis Island, the migrants, language tests, the Americans changing the names because they were difficult to pronounce and spell? The Moskowitz family, the dreams, tailoring business, life in the city? Poverty, crowding, hard work? The sweatshops? 7. Feivel, survival, in the bottle, washed ashore? The encounter with Henri? Henri and his French style, debonair? The building of the Statue of Liberty? His flying with Henri and sharing the song? The spirit of optimism? 8. Warren T. Rat, the spiv on the New York streets, getting Feivel and selling him to the sweatshop? The hard work, the bosses, the stances taken? Tony as his friend, streetwise, tough? 9. The escape, the search for the family? Wandering the streets of New York, the gangs, the types in the tenements, the drinkers? Tony and his meeting with Bridget? The parody of the suffragettes - campaigning against the rule of the cats? Feivel and his meeting with Honest John, with Gussy? Feivel and his plan for the secret weapon, against the cats? 10. Feivel and his search, hearing the violin, his going down into the sewer, finding the gang, Warren’s Maulers? Warren - and his being unmasked, a cat in disguise? 11. Final, trapped, his becoming friends with Tiger, Tiger and his sense of humour, weaknesses, wanting friends? The building of the secret weapon? Its being unveiled? The Giant Mouse of Minsk? The reaction of the cats? Their rushing to the wharves, onto the boat for Hong Kong? 12. The happy ending - the family, adapting to New York, their joy in being reunited with Final? Tony and Bridget? The humorous history of the migrants at the beginning of the century?